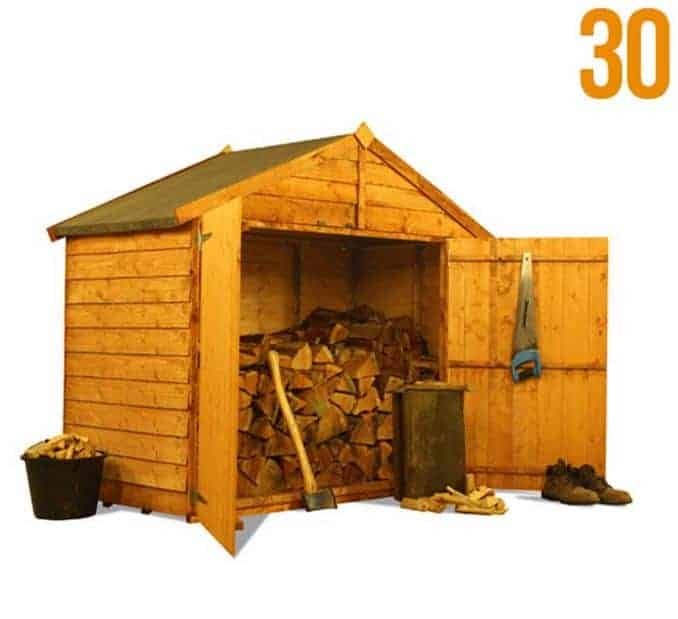 This is a basic log store at a basic price. It has an apex roof and overlap cladding. There is plenty of space here for logs, and you can optimise the space by using the apex. 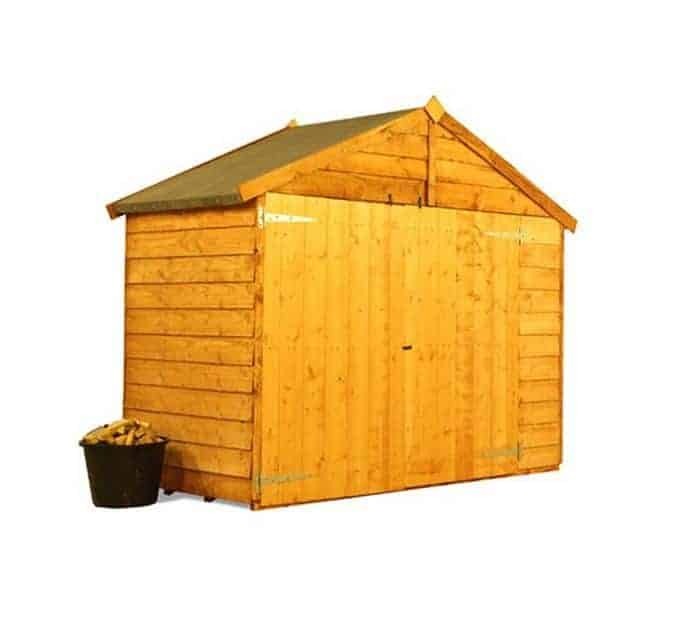 This is a log store that is perfect for helping you to manage your logs all year round The unit has plenty of good features and measures up at 1.96 m in width and 0.92 m in depth. 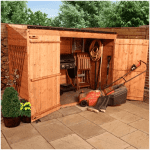 The log store has a unique apex roof that allows it to have a traditional look while also ensuring that the unit is safer than usual when it comes to rainwater. 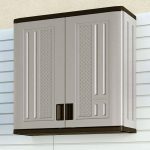 The water simply runs off, providing you with a log store that actively works to protect the dryness of the logs inside it. It’s a nice aspect and it is visually pleasing too. 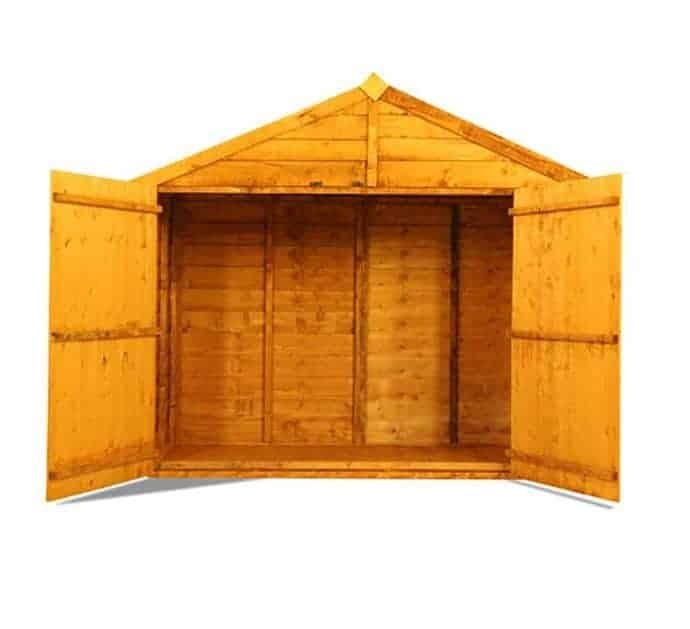 The apex roof also adds even more value because you can simply store more logs in the building thanks to the extra height afforded by the roof. 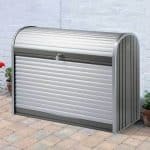 The unit comes with overlap cladding. 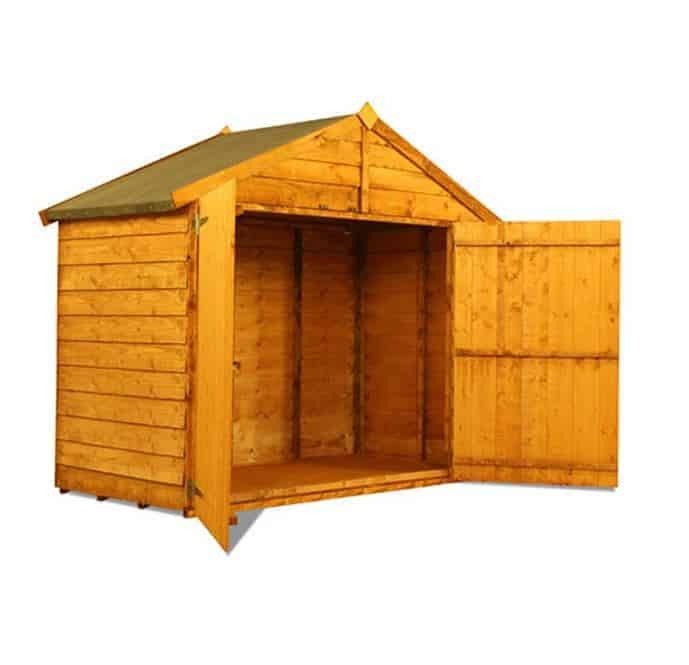 This is relatively inexpensive to create and therefore it makes a difference with the price of the log store. 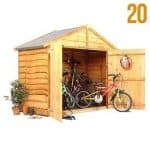 The overlap is quite effective when it comes to giving you protection against rain, but it has a real aesthetic appeal, and makes the log store look very traditional and rustic. The unit doesn’t come pre-treated, so you will find yourself having to treat it on an annual basis. It is a little bit of work, but it does at least ensure your logs are kept nice and dry due to the protection the treatment brings. No windows, but a pair of double doors that open up very generously. 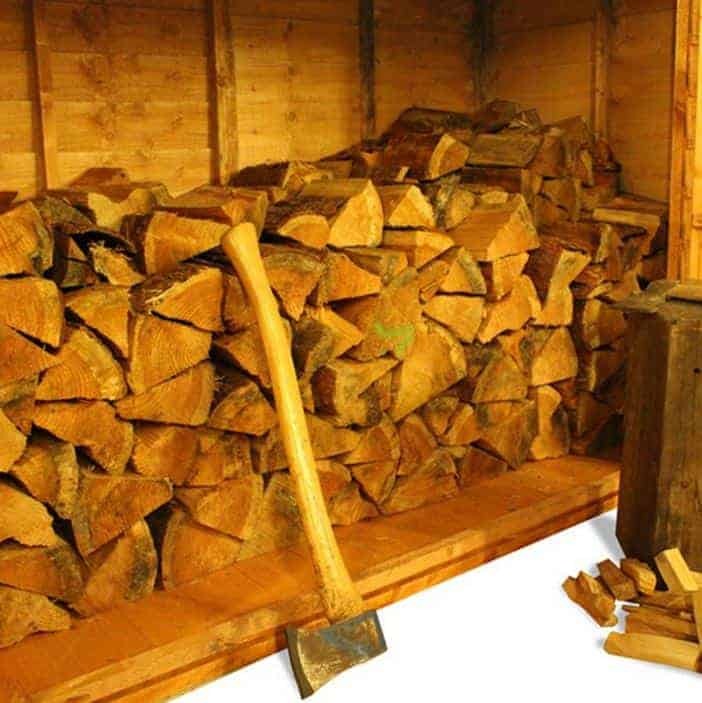 It’s all about maximising the space inside the building for storage, and the log store here really allows you to get inside and store the maximum number of logs. No windows, and there is the option of fitting a padlock if you want to do so. Logs can be expensive so it is worthwhile exploring this. The building kind of comes into it’s own here, with some clear options that make it easy for you to develop things a little further. You can opt for having no floor if you wish, and you have the technical ability to fit your own. 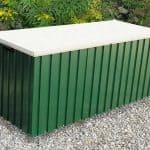 Otherwise there are two clear options.The first is solid sheet flooring, which we personally would not recommend simply due to the fact that it doesn’t provide the very best protection against rainwater (remember the logs need to stay dry). Tongue and groove does provide protection, and for a small extra cost, it is worth buying it. You also get the opportunity to choose the colours of the trim and the walls on your log store. It is worth considering and can really make the building more individual. Finally, you can purchase padlocks and hasps. We weren’t enamoured with the cladding, but at this price you can’t really complain. However, the option to buy a tongue and groove floor when you have overlap cladding does seem a little pointless. The building will last, presuming you treat it and replace the felt roof when needed. 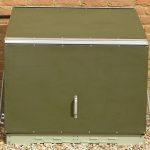 This is for logs, and there is ample room here for a log storage option that requires the ability to keep and look after a large number of logs. Very easy to put together, and the unit is pretty solid too. A fixing kit can be bought to help out. This building hardly costs anything, but that doesn't always mean it is good because of it. If we were to change anything, it would be the cladding. This affects the value score. Final Thoughts: A low cost solution to log storage, this building has a couple of issues. The main one is cladding, and we thought we would be straight up here. We are surprised to see that you can buy tongue and groove flooring and not the cladding equivalent. A suitably sized building that isn't quite as perfect as we hoped it would be.